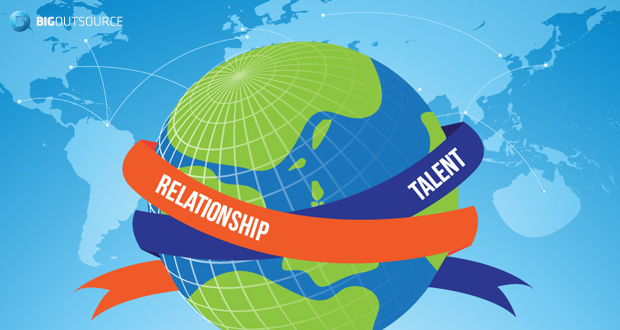 Relationship and Talent Acquisition: Keys to Future Sustainability of Outsourcing? With the much-praised bullish growth prospects cast over the Philippine Business Process Outsourcing (BPO) industry, it is hard not to get excited. It’s as if there’s nothing more that the Philippines must do to prove that it’s the best destination to outsource any kind of services. The business of outsourcing is still young in a country like ours. What we have achieved thus far speak only of few services that we can offer, particularly the ones which are non-strategic business functions like contact center, technical support, IT and back-office functions. Yet if there have been growth in higher-value works in the value chain local companies are getting, our share out of the bigger picture remain dismally marginal. And most obviously for outsourcing companies around the county, it’s not yet the right time to celebrate because there’s so much work to do. In the past years that we’re into the business of outsourcing as provider of high-value virtual talent and value chain-based services, we are deeply looking into the key challenges that would limit further growth to our business. We have seen a lot of risks, threats and many impediments to deliver a really satisfying outsourcing experience to a partner. Let us focus on two key challenges as well as how we could bring out the most out the resources at our disposal. Partner relationship. An outsourcing partnership does not stop the moment the buyer and provider signed the contract for engagement. It’s the starting point of busy times ahead any outsourcing partnership to ensure they maintain their cooperation, collaboration, and co-developments to achieve their goals. Competitive advantage that is sustainable is achieved when the partnership are mindful of their short- and long-term relationship. When trust and commitment is established, both parties will benefit from improved performance. Hence, as Alessio Ishizaka and Rebecca Blakiston posit in their article, Look After Your Outsourcing Relationship to Make It Successful, the partnership between an outsourcing buyer and the provider of outsourcing service to be successful lies in just how much they give serious and continuous attention to their relationship. One proven solution is maintaining and establishing personal contacts and open communications between both companies. Engaging the best talents boost your organization’s competitive advantage. Yet finding, attracting and finally hiring high-value talent will also need to be sustainable in the long-term. As volumes of jobs continue to increase, the demand for high-level, skilled and expert talents will surely surge. While there may be many candidates, but the key remains to be in quality not quantity. Talent acquisition processes must be efficient to bring out the better from the merely better. It will also be uniformly necessary that the engagement of new hires contribute to the overall value of the company. According to Ochre House director Paul Dalley, proactive sourcing must be ensured. The future demand for talent acquisition speaks of shifting the gears from being reactive to creating a proactive talent sourcing. This means in part partnering with specialist consultancies to deliver this capability. While many literatures abound offering answers to questions around how to stay relevant, competitive and sustainable, for the time being, we can simplify our problems by focusing only to relationship and talent acquisition. There is no denying that the strength of the service buyer and provider’s relationship will propel their business from short to long-term growths. Talent acquisition is also a challenging new field that would create public conversations in the future. At Big Outsource, it is our motto to always go beyond delivering the most appropriate in order to satisfy our client partners. If outsourcing companies will commit, they will invest in making sure that partnership with clients last and that the processes in acquiring talents do not merely end at supplying the demand, it is the role of the provider to enterprises to engage them as well in sharing their goals that would encourage the development and deployment of strategic skills among their staff. Recruitment challenges in Asia Pacific: the sustainability of talent acquisition?